Our Daily Deal today is a timely must-have because let's face it - it's still cold out there! 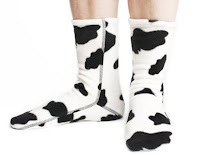 Funk up your feet with these anything but boring socks. Great for indoors and out - and they're made in Canada. Kit out the whole family - we have sizes from XS kids to XL adults! For today only we've reduced the price by 40%, and only while stocks last. Simply click below for more information and to purchase. The contour fit makes these super soft socks just as good for keeping warm in shoes and boots outdoors as they are for cozying up inside. Fleece wicks moisture away from your skin and dries quickly. Flat lock seams ensure no rubbing or chafing. Stay up without cutting off circulation. Make great bed socks. Wear well with no fading, shrinking and they won't mat or pill. Hypoallergenic. Anti-skid sole on kids' sizes ONLY. Match with shoe sizes here. Facing anything is really needed.